More than 400 years ago, Shakespeare had a clear eye on what scientists are only relatively recently finding—that sleep is key to both physical and mental health. But sleep, like money and love, is something many people feel they can’t get enough of. And for older adults, good sleep may be especially scarce and poor sleep particularly hazardous. A recent study in Sleep indicates that a lack of sleep increases hunger, causes food cravings, and makes it more difficult for individuals to control their calorie intake; thus, it’s linked to obesity. It’s also known that lack of sleep contributes to hypertension and cardiovascular risks, increased risk of type 2 diabetes, and mood disorders. It influences immune function and may contribute to inflammation, and it even puts people at greater risk for the common cold and other infections. Last year, University of Wisconsin-Madison scientists found that sleep pares back synapses, relieving the overload of memories stored in the brain. By sleeping, paradoxically, we forget in order to make room for new memories. It’s not surprising, then, that researchers increasingly are making associations between sleep and Alzheimer’s disease. Studies have concluded that as little as one night of lost sleep contributes to a rise in beta-amyloid and also that increased beta-amyloid is linked with deteriorating mood following sleep deprivation. 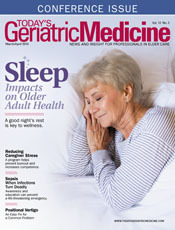 In this issue’s cover story, Jamie Santa Cruz looks at the way age changes sleep, the unique challenges older adults face, and the impact inadequate sleep has on geriatric health. As research mounts about not only the restorative benefits of sleep but also its preventive powers, it becomes increasingly clear that geriatricians could make a significant difference in patient health by prioritizing discussions about sleep with all their patients. As Santa Cruz demonstrates, emphasizing the importance of adequate sleep and helping patients achieve it may make a difference in their mood, reduce their risks of certain illnesses, and help in weight management. Furthermore, it might reduce their risks for Alzheimer’s disease and other dementias. Sleep, says the Dalai Lama, is the best meditation. Clinicians shouldn’t miss an opportunity to emphasize its importance and put it on a par with diet, exercise, and stress management as a core component of wellness.